Okayama is famous for many things, specifically Momotaro, the peach boy, but also for kibi dango. Kibi dango is a variation of the Japanese dessert, dango. Dango is simply mochi, a gluttonous rice cake that is formed into a ball. It is often on a stick with various toppings. Kibi dango is famous in Okayama and made of a different type of flour, rather than rice. When going to Okayama, you can’t go through the station without seeing kibi dango for sale. They often have Momotaro characters with it but in all honesty, I don’t think it is the best dessert Japan has ever produced. In fact, kibi dango is very plain for Japanese desserts. There is one variation that is specific only to Korakuen. Korakuen is one of the 3 famous gardens in Japan and in Okayama’s Korakuen you can buy a special kibi dango. 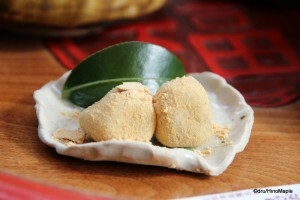 Korakuen produces its own kibi dango that comes with kinako, a type of roasted soy bean flour. It is a nice powder and it makes kibi dango taste even better. When I was at Korakuen, I didn’t buy their kibi dango but I did have a chance to try it as I was at the tea shop enjoying some tea. With the tea, you get a small sample of kibi dango to go with your tea. It was nice and light and not as sticky as regular dango. I do prefer it a little more than other types of dango but since I’m not a huge fan of dango to begin with, I don’t know if I’d recommend buying it. If you do have a chance and you want to take a load off, try the kibi dango from Korakuen. If you don’t, don’t worry as it isn’t something you have to do when in Okayama. This entry was posted in Chugoku Food and tagged Dango, Dessert, food, japan, Japanese dessert, Kibi Dango, Korakuen, Okayama by Dru. Bookmark the permalink. It’s made with millet flour? Now I’m curious.